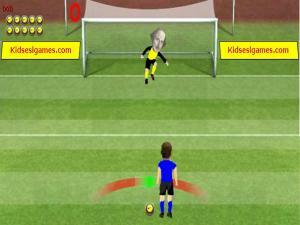 A great, interactive penalty shoot out game to practise your imperatives! Choose a goalkeeper (you can even choose Shakespeare!) and the color of your strip. Answer the question with the right imperative and have a chance at scoring a penalty against the keeper. Answer incorrectly and see your player hit the bar! 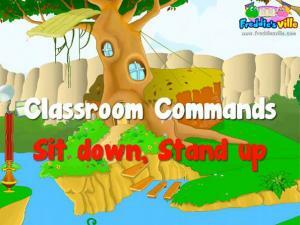 This is a great game that provides practice in all parts of speech. You are up against the clock and the jellyfish! Jellyfish with words drift towards the octopus. Read the part of speech in the octopus and click on the correct word that matches it to destroy it. You are given an overview of all the answers at the end of each level. 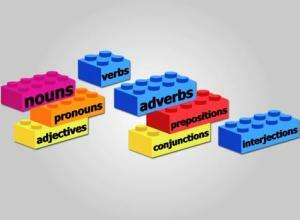 Verbs, pronouns, adjectives and conjunctions are all parts of speech. Parts of speech are necessary to build your English. All parts of speech have a specific job. 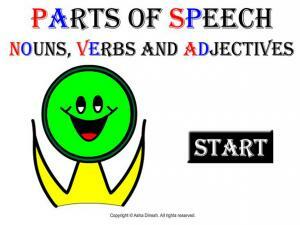 This is a study lesson about parts of speech and their functions. This game has lots of levels that get harder the more answers you get right! 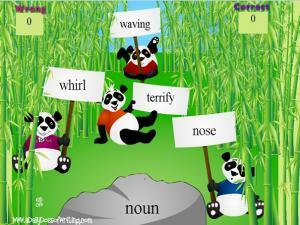 Click on the panda holding the word for that correct part of speech. 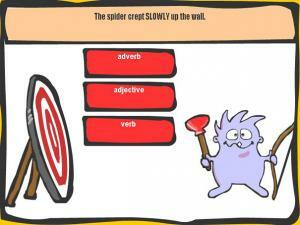 When you have mastered nouns, verbs, adjectives and adverbs you have to create fun sentences using specific words. Be as silly as you like! But make sure you match the word with the right part of speech. 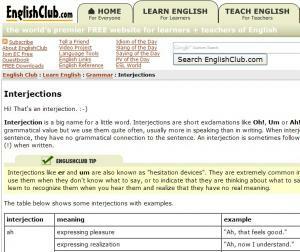 This is an explanation of interjections, words of strong feeling. 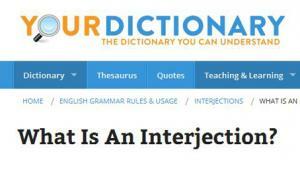 There are many examples and several good tips on how to use interjections in your writing. There's a short self-test, too! 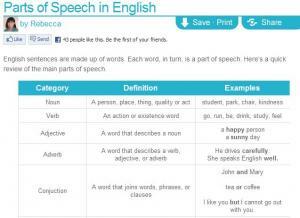 “Parts of speech” are the basic types of words that English has. Most grammar books teach eight parts of speech: nouns, verbs, adjectives, adverbs, pronouns, conjunctions, prepositions and interjections. 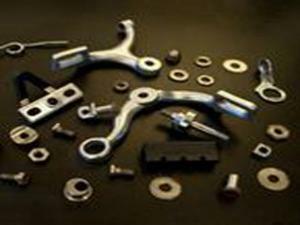 This site includes one more type: articles. 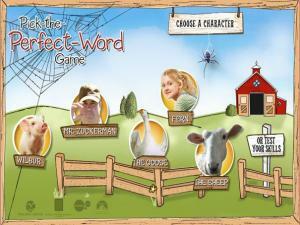 Click on a character and see how many words you can drag into Charlotte's web. 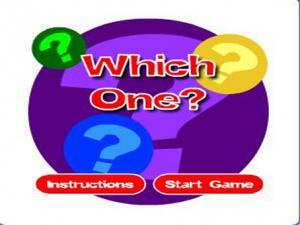 Each round asks for one type of word (noun, verb, adjective and words with prefixes). There are additional games to challenge you and test your true understanding of these major word types. 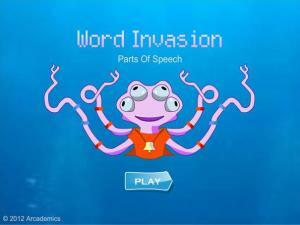 This game aims to familiarize you with nouns, adjectives, verbs and other parts of speech. There are 3 levels to choose from. Read the sentence and look at the word in capital letters. Decide what type of word it is and shoot the plunger by clicking your mouse on your answer. Score points for every correct answer. You will be given the correct answer if you get any wrong. Oh! Ouch! Um! Hey! 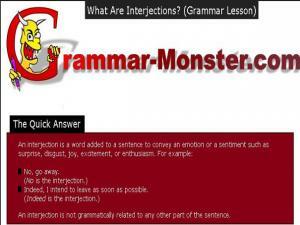 These are interjections that are typically used in English when we are speaking. Learn about these kinds of phrases in this short lesson. This video goes through the 8 different parts of speech that are used to create sentences in English (Nouns, Pronouns, Adjectives, Verbs, Adverbs, Prepositions, Conjunctions and Interjections). There are lots of examples and great illustrations to aid your learning. A great game to play and learn about a range of different word types including verbs, nouns, adjectives, adverbs, pronouns, conjunctions, prepositions, articles, clauses and phrases. Find selected words in a sentence and understand how they are used. Use the interactive highlighter to select answers and have fun completing the exercises. 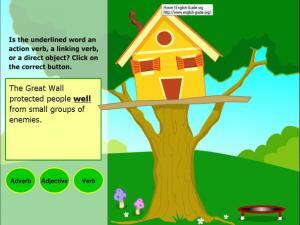 Practice using your knowledge of nouns, verbs, adjectives, plural nouns, and adverbs with this fun, interactive game. 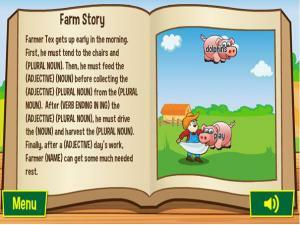 Create the story by catching farm animals or eating fish labeled with a word that matches the part of speech missing in the story. There are lots of options so try and make your story as funny as possible! This is a comprehensive tutorial that goes through and explains what parts of speech are. Watch the Introductory slideshow first.Then go through the individual lessons on the main 5 (nouns, verbs, adjectives, adverbs and conjunctions). 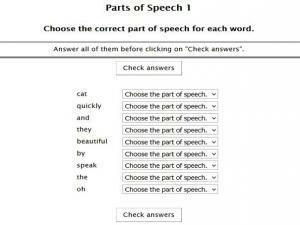 A general quiz to help you review and test your knowledge of parts of speech. Identify the part of speech of the highlighted word in each of the following sentences. 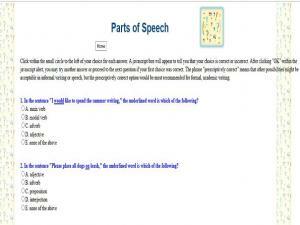 This game tests your knowledge of the different parts of speech using word connected with science. Read the word and definition, then select the correct part of speech. 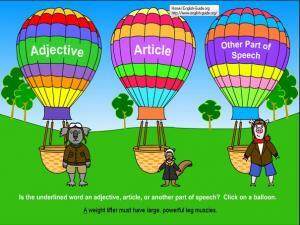 A fantastic, fun resource that allows you to practice all the different parts of speech at your own level. There is a very detailed tutorial and help while you play. 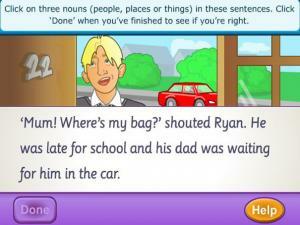 The aim is to pick the correct type of word or part of speech in each of the sentences. For every wrong answer, you will be given an explanation and a chance to try again. 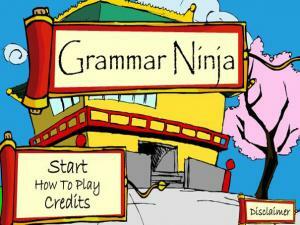 Can you complete all the levels and become a Master Ninja?